It was a very pleasant night with beautiful moonlight glittering on my terrace when I decided to do all the garden jobs that had been pending for a week. The seeds that I had sown earlier were ready to be transplanted. During the week, I had bought large containers and filled them with a good mixture of soil and manure for my vegetable plants. I spent some time marking the pots and transplanting the tomato and bell-pepper plants into the large pots. It had to be done quickly and correctly. 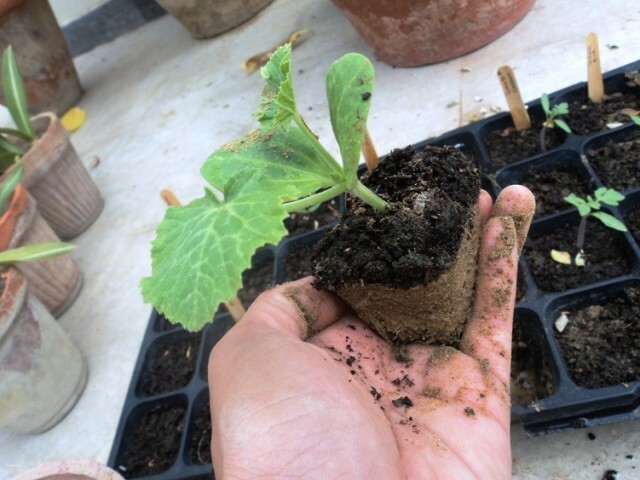 Seedlings must have moist soil and two sets of true leaves prior to transplantation. The roots are pushed up gently by a stick while you hold the top of the plant in your hands. The roots of the seedlings should not be exposed to air for long. They are to be quickly planted in the bigger pots or the plot. Then they should be watered with a soft shower. Transplantation is done in the evening when its cool. Next, I wanted to know how my plants were doing. The lime tree is producing lots of juicy limes, the orchids are blooming, the chiko has some new flowers and bright green leaves, Allamanda looks stunning even in the night, and the grafted cactus has two beautiful flowers. Flower seeds need transplantation as well, the pumpkin plants are about to bloom, Bonsai needs some attention, button roses survived trimming, potatoes and garlic look happy too but china rose has had an aphid attack. When I was done with a round of the garden, I sat down, looked around at the plants and thought about how much they had grown. It felt good to see the seeds that I had sown were growing, trees that I planted were fruiting, and all together the garden created a beautiful blend of shades of green and contrast of colours. Thank you, God! I looked up in the sky and got lost in the brilliance of the moon that shone right above my terrace and the bright star that shined beside it. Are you going to pig out today? Zahra….your posts are so refreshing…and positive..
One day, hopefully, that elusive thing called success shall be mine too. I’m learning…..I’m learning…. @ Ahmed, I hope you are one of those. @ Sadaf, Sure you can grow tulsi and basil very easily. Get a healthy plant or grow from seed.I have few too. I have not done much research on Ratan Jot. But I know that it grows in Kashmir which is a totally opposite to Karachi, climatic conditions wise. @ Munira, Wow Strawberries!! Are you in Karachi? I usually plant my strawberries in late November or early December. Do keep me posted on its progress. wow ! you have done pretty job !